This necklace is made using nylon cord in combination with satinique cord. It measures 16 to over 19 inches, with a center jeweled piece that adds 2.5 inches. It is done in a black and red. 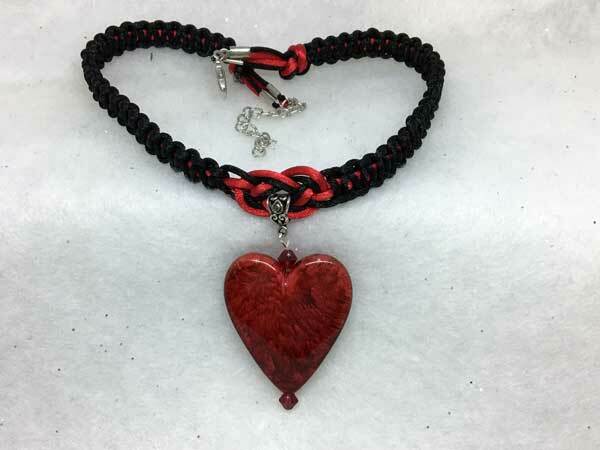 The jeweled piece is a beautiful elongated red heart with an interesting pattern throughout. I have surrounded the focal pendant with large dark red bicone crystals on top and bottom. It is a pretty piece that will certainly get noticed! It is finished with a lobster claw clasp and added chain for more versatility with the length.